For years I made New Year’s resolutions: lose weight, start an exercise program, have better health, give up chocolate, and myriad other impossible proclamations. While my husband recovered from his stem-cell transplant, I spent all of my spare time in bed. I felt grumpy and depressed and weighed fifty pounds more than I should. All of my resolutions clustered around me, tying me to my perpetual inaction. And then I learned a secret. ‘Resolution’ simply means to decide on a course of action—there’s nothing to ensure that I stay on course. Lofty plans sound great on December 31, but without action they fall by the wayside quicker than couch potatoes running a 5K. ‘Solution,’ on the other hand, means ‘the act of solving a problem’ or ‘the state of being solved.’ Action equals motion. This year, decide on solutions to problems and ditch the resolutions. Start with a list of things you’d like to accomplish, and then brainstorm ways to make those things happen. Don’t focus on your goal, though. You might end up feeling overwhelmed. Focus on the little changes that you can make each day that add up to big changes over a long period of time. Those daily choices add up. Give yourself grace during your journey to forming new habits. Since saying ‘Adios!’ to New Year’s Resolutions, and acting to solve problems I saw in my life, I’ve lost those fifty extra pounds, lowered my cholesterol and learned that chocolate isn’t the enemy. I have more solutions to work out in my life, but I’m not the grumpy, frumpy middle-aged lump I used to be. You can find out more about learning to really nurture yourself over at my other blog. On my journey, I’ve discovered lots of solutions to adding extra movement into my life and finding healthier ways to deal with stress. Whether you’re a busy mom or a stressed-out caregiver, remember to give yourself grace for your journey. Change takes time (more than the month of January) in order to remain permanent. If you’d like to find a grace-filled support group, check out Faithful Finish Lines and their two-week FREE Grace Camp (affiliate link). Gotcha! Check your email for a link to the printable! As I stood under the spray of my shower yesterday morning, the what if moments of our cancer journey replayed through my mind. The remonstrating hospital staff telling me that I shouldn’t do that repeated in my head as well. But my son bleeding in his tears haunts me and I’ve always wondered how I let him get that sick. The bruises spreading like wildfire as I drove the hour to the hospital have sent their own bruises into my mind, leaving black holes of self-doubt. The wondering voices of nurses who came back to see us our third and fourth week in the hospital, speaking in awe that Andrew was “still with us” as they hadn’t “thought he would survive the first few days” have sounded like a gong of “bad mother” through my head. What if I had brought Andrew into the doctor earlier. If only I had known the bruises wouldn’t make doctors think of abuse, but of cancer. If only we hadn’t all caught that flu bug. What if I had taken Andrew to the doctor when he first began throwing up? This week is a sad, confusing and rejoicing week for our family. It was thirteen years ago this week that my four-year-old Andrew was diagnosed with leukemia – a terrible day, an awful week, a horrible month and a terrifying time. Also, a friend (found through this website) had her oldest son (Gianmarco) diagnosed with leukemia this week two years ago. Sadly, he didn’t survive the fight. Another little girl (Julianna) I’ve been praying for many times a day (click here to read a post), passed away on Friday, the valiant victim of DIPG. The difference for this caregiving mom is that my son is a survivor. He didn’t survive because of anything I did or didn’t do, nor did those others pass away because of anything done or not done. It’s the ugliness of cancer. Our battle wasn’t easy, and at times it still isn’t – but we’re out the other side of that cancer fight. For the two moms mentioned above? My heart aches for theirs as they mourn the loss of their beautiful children. I couldn’t help myself this weekend, I’ve been thinking about the what if and if only thoughts that have plagued me. I wondered about Gianmarco’s mom and Julianna’s mom and I know that these thoughts hound them too and I prayed for peace. After thirteen years of beating on myself (logic says not to, but emotion often doesn’t agree), I heard something different yesterday. Suddenly I actually HEARD that. As that memory popped into my head, so did the distinct realization that had I taken Andrew into the doctor earlier, that doctor would have told me the above lines. After which, I would have gone home and proceeded to treat my boy as I was: juice, water, rest, anti-nausea medication and lots of cuddles. I would not have gone in again very soon – not wanting to over-react to throwing up, paleness, and listlessness. What if I had gone in earlier to a doctor, like I’ve been kicking myself for not doing? I would be, right now, so ANGRY at that doctor for not catching the leukemia. They all assured me it was acute and extremely fast and hard to predict until it was almost too late. Immediately my what if and if only mantra that I’ve clung to for years changed tune. First, catching leukemia early doesn’t mean you don’t have leukemia. Second, What if my waiting saved his life because he was diagnosed and received help just barely in time. Literally one day later and he might not have made it. If I had gone in earlier, I might have gone in the second time too late. The Bible tells us that to EVERYTHING there is a season. Not my timetable – His. God says that He’s got the whole world in His hands. Not mine – His. Jesus said that He holds the keys to the grave. Not my keys – His. I know that. Logically. But I too often forget and try to place things on my own shoulders that are designed for Jesus to carry for me. Caregivers, moms and dads, loved ones – let go of those what if and if only moments. We can’t go back and change them anyway, and maybe things worked the way they were supposed to in spite of our limited understanding. Our lives don’t always feel good (please keep Gianmarco and Julianna’s families in your prayers) but God ALWAYS has our best interest in His plans. What if we let Him keep control? Autopilot becomes the way we handle things flung at us as new caregivers. Actually, who am I kidding? It didn’t get easier just because it became longer – in fact, the longer I lived on emergency-ready, life-and-death mode, the grayer my world became. My son was four-years-0ld when we started his cancer journey, and I was 39. When we finished chemotherapy, he was 7 1/2 and I was 93. My always-learning brain had turned to mush (Anita calls it chemo brain by proxy) and I literally saw through a gray haze. I functioned on autopilot – but it worked, because of Who my pilot is: this is a poem I wrote shortly after finishing chemo and realizing I was in deep-struggle-mode. Put God in the pilot seat! It’s been sitting for nine years, safe in the bin I threw it in when I tried to return to “normal” after Andrew’s last chemotherapy appointment in December of 2007. I cherished each card, letter, poster, and note people sent to us. But suddenly, that year, I needed to hide them. We had more than enough reminders of Andrew’s travel through three and a half years of leukemia treatment. I felt desperate to return to life. Safe in the bin where I placed them. Reminders of support and love. This week my school is kicking off the Pennies for Patients campaign for the Leukemia/Lymphona Society. On a search for the Pennies for Patients poster that featured Andrew, I rifled through that plastic tub that I have kept safe, but untouched for years. Just opening the lid provided a lightning flashback because of the innocuous heplock flush valve lying on top of the last MRI results. I could not read more than 6 or 7 cards, as the tears blurred my vision. The valves, flush syringes and deadening cream in the bottom of tub ensured the return of the cover. But not before a huge rush of appreciation and love flooded me. I saw some imaginative and slightly odd cards decorated with love by children none of our family have ever met – those children who prayed for my boy. There were recognizable post-it-notes that I would find on my desk after returning to work after a nine-hour-day at chemo. I read hand-written poems and prayer placed in my mailbox by my high-school students and a note left on my clean pile of laundry by a friend. A couple of empty envelopes baffled me, but just until I remembered the lady who sent us half of her over-time check for 6 months straight to help us out. I hadn’t met her then, but she chose to bless us anyway. A tub full of blessings and love waiting for when I need it, or when I can handle it. A safe place full of reminders that our world holds beauty in the midst of ugly, and safety in the middle of a storm. Confessions my FMF friends: I honestly have no idea how long this took me to write. I got hung up on the tub full of blessings tonight, which forced me to write when I thought I had nothing on the prompt! Today we celebrate National Cancer Survivors Day—a day to celebrate survivorship as well as bring attention to the fact that winning cancer doesn’t always signify that the battle has ended. It’s a day to cheer on those who survived as well as acknowledge that survivors face ongoing challenges. Cancer changes everything—it changes one both physically and financially; it causes trauma in family members and caregivers; it can alter the course of one’s career. All too often the survivor never mentions the subtext of those multiple ‘survivorships.’ But the reality of life post cancer can prove just as overwhelming as life during cancer. In our case, cancer’s ravages left Pedro in a weakened state that took over a year to recover from. To this day, he has neuropathy (nerve damage) in his right foot that prevents him from enjoying hiking great distances. The chemo drugs also caused necrosis (death) of the bones in his hips and about seven years after cancer he had to go through core decompression surgery on one of his hips. Eventually, he’ll need a hip replacement. Each of those subsequent treatments puts a financial strain on our family. A clean bill of health doesn’t mean that a survivor no longer has to worry about financial stresses and corollary health issues. It took us 12 years to pay off cancer. For some families, it takes even longer. The emotional toll can nibble at different family members like a piranha, quietly wounding the soul until the wound festers and rises to the surface. In retrospect, I wish I would have signed the family up for counseling to treat the wounds as they happened—it may have made a difference. On the other had, I can’t let regret become a piranha in my life. Cancer survivorship can cause upheaval at work as well. Pedro lost his job because of his cancer, and it took nine long years and additional schooling to rejoin the education workforce as a full-time employee again. Of course, his experiences during those nine years working in construction, building a house, substitute teaching, and going to school uniquely prepared him for the job he holds now as the principal of a private school that operates almost exclusively on donations. These five tips for celebrating a survivor will help you think outside the box when it comes to celebrating with a survivor. 1. When you celebrate a survivor, remember that that battle might not be over—it’s just being fought on a different front. 2. Continue to come alongside a survivor (which means listen more and talk less). 3. Don’t be afraid to ask sensitive questions—What do you find the most difficult part of your life after cancer? or I know you’re in remission, but do you still need support in any way? 4. Offer to help. Maybe the survivor could use free childcare once a month to reconnect with a spouse. Perhaps the survivor needs help cleaning the house or shopping for groceries as they build back their strength. 5. Give advice sparingly (and only when asked). Survivors don’t need to hear about your neighbor George’s second-cousin-once-removed who had cancer and went on to win an Olympic medal). What about you? Do you have a survivor you’d like to acknowledge? Tell us a little about them and their battle and leave a line of kudos and encouragement (and don’t forget to let them know in person, too). 1. Link up an inspirational post. Have you ever had a focus problem? Mine started when I became a parent (parenting is HARD work and seems to require all of our focus! ), and intensified during my caregiving journey. About three years after Pedro’s miraculous healing, I realized that I needed to re-find my health. Our girls needed a mom who could keep up with them as they entered their pre-teen years, and I had a hard time doing much of anything. Suddenly, I had a new focus. It took nine months of hard work, eating better and exercising more, but I eventually lost my caregiver weight (I may have over-focused on weight-loss and healthly eating, though, because our youngest daughter ended up struggling with aneorexia her sophomore year in high school). 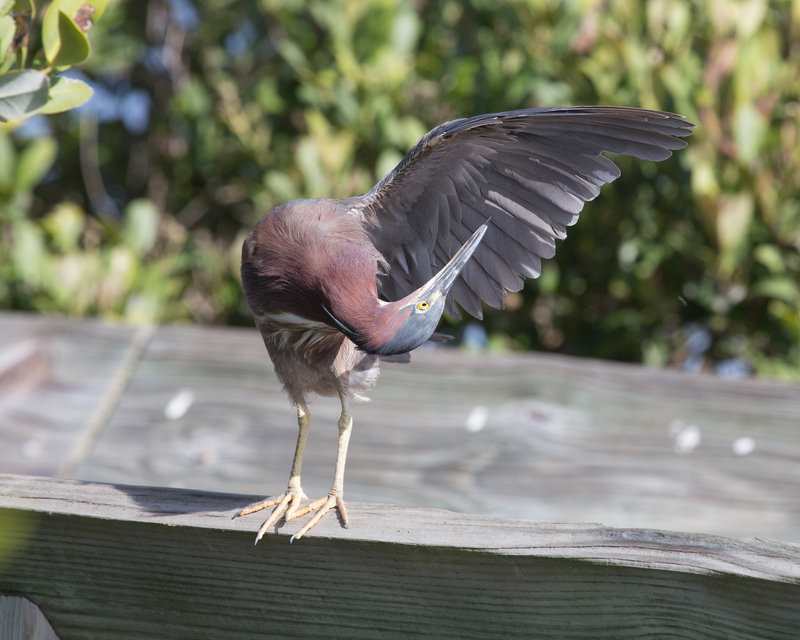 When I took a photography class six years after Pedro’s recovery, I started to realize my my focusing problem. Hyper-focusing on something has its advantages—a photographer can create ‘bokeh’ where the subject matter jumps from the print and everything outside the plane of focus takes on a soft blur. On the other hand, spending the time to stitch together a panorama that shows a larger-than-life view of the subject can produce a startling effect, too. I’ve learned to ask myself which kind of focus I need in a situation. Do I need to focus intently on something small and detailed? If so, for how long should I spend time on that one thing? Would stepping back and looking at the bigger picture help me more? I actually find looking at the bigger picture a difficult task. Out of the 80,000 or so (but who’s counting, right?) photos that I’ve taken in the past five years, only a fifth of them are landscapes. Life reflects art. I do ok focusing on the small things and the details, and I can even do some mid-range planning (for a few months or years) but I hesitate to step back and look at the really big picture—my life and where I’d like to be in five, ten, fifteen or even twenty years. That’s why a letter in my inbox got me pretty excited this week. I’m on the launch team for Michael Hyattt and Daniel Harkavy’s upcoming release, Living Forward. Living Forward is a book about creating a life plan. Other than a vague sense of ‘I’d like to get married, have some children, have a fun job and enjoy life’ I’ve never had a life plan. I’ve had a great life drifting, but it’s time to step back and focus on the really big picture. I want to stop drifting and start living intentionally. You can find more information about the book by checking out this post. After reading the first chapter, I can’t wait to read the rest of the book and start charting a life plan (aka, focusing on the really big picture). What about you? Do you have a life plan or are you like me, just drifting along? I learned the hard way what happens when I lose my focus. I opened the box and quickly tore the wrapper from around its contents. Ah. Pure bliss—a thick layer of dark chocolate covered an incredible sweet bar of chocolate ice cream. “How do you spell relief?” I asked myself. “H-A-A-G-E-N D-A-Z” I said under my breath as I bit into heaven and I started trudging up the eleven flights of stairs to Pedro’s hospital room. I took the stairs because I wanted to eat an ice cream bar, and I figured the climb might cancel the calories. A niggle of doubt wormed into my brain. After all, I’d already put on about 45 pounds since Pedro’s initial diagnosis with non-Hodgkin’s lymphoma six months earlier. Unfortunately, I had lost my focus. I had focused so intently on helping Pedro get well, that I lost sight of myself and the bigger picture of my life. I coped with stress by eating—too much, too quickly and too often. I had quit exercising (I had a perfect excuse—big cities had dangers around every corner, and if something happened to me, what would happen to Pedro and the girls?). My focus had caused a severe case of denial. As in, I thought I needed to deny myself everything good and healthy in my life in order to help Pedro, and then I ignored the results of my denial (increased feelings of tiredness and ability to cope without resorting to crutches—like chocolate). Photography eventually became the catalyst to help me understand balance in my life. But that’s a story for next week (and my five minutes have ended). What about you? 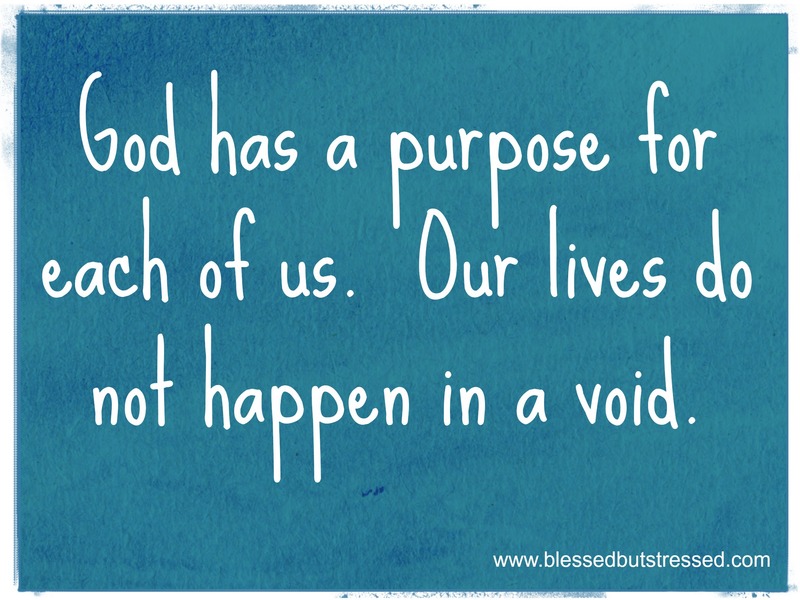 Have you ever had a season of caregiving or extreme stress that caused your focus to slip? I have a huge, thick, gargantuan neck. When I wear something with a rounded collar, my face doubles in width and takes on a moon-like glow. Ever since I noticed this amazing propensity of necklines to change the proportions of my face, I’ve avoided athletic t-shirts and turtlenecks. My legs resemble those of a chicken’s. I remember reading an article in Glamour magazine back in the dark ages—I think I had started my freshman year of college—where the authors detailed how to measure your legs to see if they had perfect proportions. Mine came pretty close, according to my measuring tape and my best friend (who envied my lanky legs and my comely calves). “But you have a nice neck and a tiny waist,” I pointed out (my theory was that women have either a waist or nice ankles and calves—but very few have both). Later that same year, my friend confessed that she’d stopped at a bakery and purchased a dozen chocolate chip cookies—and eaten the whole box. I shrugged. “That sounds good,” I said, “although I can’t imagine eating 12 cookies.” It wasn’t until years later that my friend confessed to me that she struggled with bulimia. Her tiny waist came at a great cost to her mental and physical health. Food has played a sinister role in my life as well. I discovered its self-medicating properties when the world seemed scary. During Pedro’s bout with cancer, he dropped to 130 (five pounds less than my pre-pregnancy weight) and I blossomed to 185 (his pre-cancer weight). 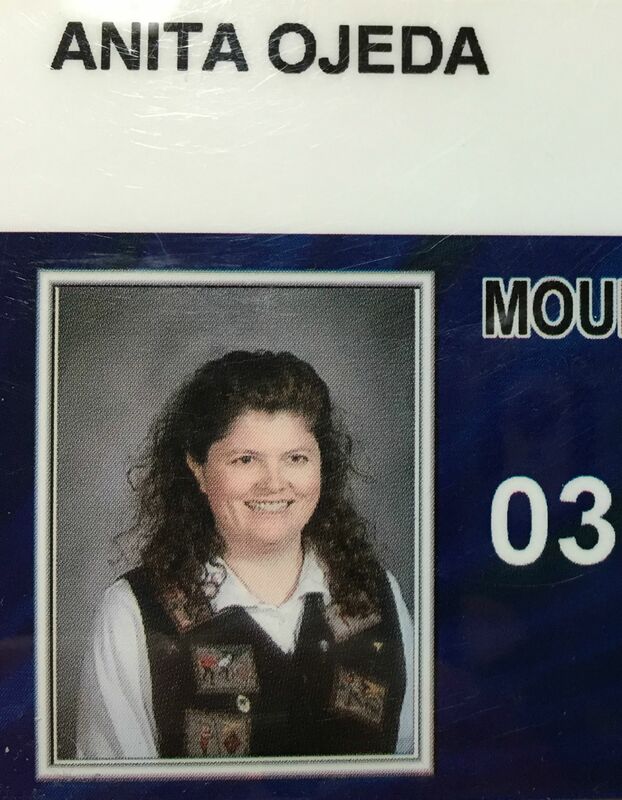 The only known photo of me during this time is on my school ID card—I couldn’t avoid having my photo taken. My neck looks even larger than normal—but I consoled myself that my calves and ankles still looked pretty good. Two years before my fortieth birthday I decided that I didn’t want to be a ‘fair, fat and forty’ statistic and end up with gallbladder problems. I wanted to have energy to keep up with my almost teenage daughters. Maybe they would even take pride in their mommy. I went on a low-carb diet and over the course of ten months I slowly returned to my pre-pregnancy weight. The negative thoughts about my weight remained. In fact, I hate having my photo taken because I want to live up to my ideal image of what I should look like. All too often the photos that others take don’t meet my expectations. Don’t get me wrong. I don’t spend hours in front of the mirror putting on make up (I got too lazy to wear that stuff about six years ago). My daily hair routine involves running a wide-toothed comb through my curls . That’s it. I have no feelings about my looks—unless someone snaps a photo that I deem ‘horrible.’ It’s possible that I’ve asked my children to erase photos of me that they took on their phones. The struggle with food didn’t end with my initial weight loss, though. I will never have the metabolism of a hummingbird. Food will always sound the siren call of comfort when I feel stress and pressure building in my life. In January, after an extremely stressful year, I realized that I had slowly gained back twenty of those 55 pounds I had worked so hard to lose. I decided I needed accountability, so I bought a FitBit and started keeping track of what I ate on the FitBit app on my phone. A few of my blogging friends have FitBits as well, so we challenge each other to keep moving during the week and on the weekends. My employer’s health program gives rewards for weight loss and exercise, and so I decided to enter my stats in their database as an additional form of accountability. About the third time I entered my stats, I came to the shocking realization that the measurement for my calves is THE SAME as the measurement for my neck. All these years I’ve lived with the distorted belief that my neck is gargantuan and my calves are slim. I’m ready for more accountability, so snap away—I promise to never ask you to delete a photo from your camera or your phone (it might take me awhile to view the photos without wrinkling my nose, though). My neck and calves measure the same—and I am fearfully and wonderfully made. My neck and calves measure the same--and I am fearfully and wonderfully made. Click To TweetMy job is to keep my mind on positive things and my body as healthy as possible. That Glamour article promised perfection if my legs measured up. But I’d rather have perfection in my relationship with God and with my fellow travelers. How about you? 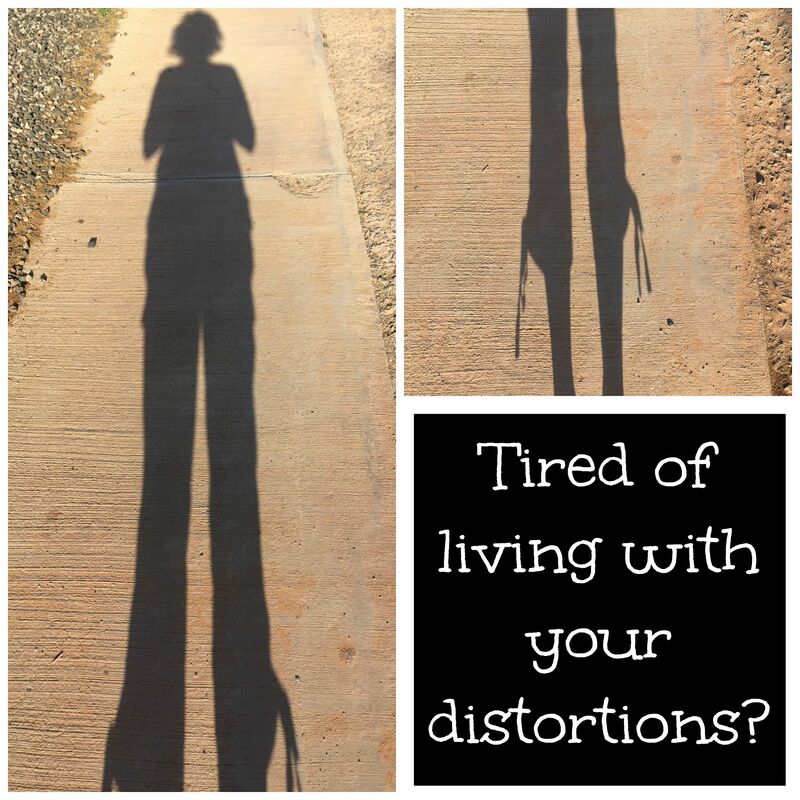 Do you have any distortions that you’ve discovered and are ready to let go of? I sat quietly on the steps of the farmacia on the corner, fanning off flies, vendors, and heat. Almost directly in front of me, young soldiers guarded the square dusty space between the town and the border crossing; the gateway to my own country waiting to welcome me back. To my left lay the town—the town that tourists don’t see. The shops that the locals frequent. The shops without air-conditioning; flypaper hanging in the doorway and globs of cement forming steps. The part of town where houses cram indiscriminately between the street and the businesses. Houses that may or may not have running water or electricity. To my right stretched the street that was designed for me to see. Fancy tilework and nice storefronts invite one in to shop –into the air-conditioning and out of the stifling heat of the dusty street. Vendor stalls lined up in front of the stores and the hierarchy was clear: Air-conditioned stores first, vendor stalls second, vendors on foot third and of course, beggars last. I’ve known that for years—it’s true of most countries or cultures around the world. But this day, because I had lost my family, I had a different view. Neither a tourist nor a local, once I waved away the on-foot vendors, I became invisible while sitting on that fake marble stairway. And the clash and the mesh of the different worlds kept me captivated. The children, the ones with the professional beggar faces? I watched as they approached other tourists with the same sad faces and slumped demeanor. But I also got to watch as they ran back by me, giggling and poking each other to rest in the shade I had found. They stood around and laughed and joked until someone new came from beyond the crossing. One little boy poked the other, “It’s your turn.” A new little girl was prodded into activity. “What is it again? Twelve for one dollar?” Eyes rolled as they went through the prices again for her and off she went, to look sad and helpless and try to sell some visiting Meester her quota of chicles. The waiting children spoke of school and their families and which street vendor would be most likely to give up some taquitos. They brought lunch or maybe a water bottle to one another. One street vendor ran into the farmacia where I sat and a moment later burst out the door and ran over to an over-dressed couple who waited in the street. He handed them what they wanted, and I wondered how much he made on the 15 steps he took to sell it to them. I almost laughed aloud one moment, listening to a vendor bargaining with a tourist. They hassled and harangued and jostled back and forth with the vendor whining about feeding his family and the tourist declaring she only had so much money with her. The lady walked away happy with her deal and the vendor turned down my street to check his iPhone for messages. I loved it every time one of the vendors would dash into the farmacia for something, because the air conditioning from inside would blast out onto the dusty street, cooling me as it went by. The two faces of a poor border town. The beggars with smart phones and the well dressed store workers walking around the corner to have lunch in their electricity-less houses. Every story has two sides, right? 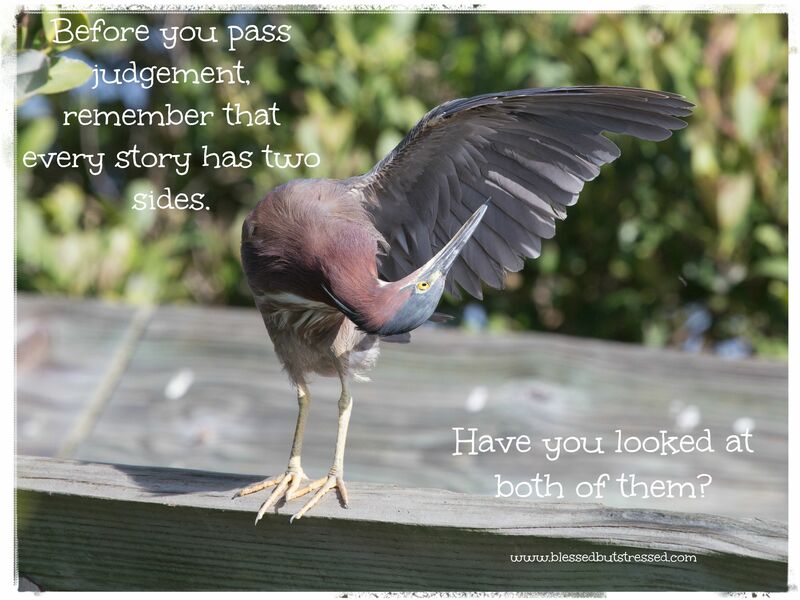 So often we judge on the side that we see and forget there might be another view, or more information. Two sides–the sad face to sell, but maintaining the pride of not begging. There’s always more to the story. Having a child fighting cancer and on chemotherapy for three years provided many opportunities of growth for me as a mother. It also seemed to provide many opportunities of judgement from others; people who assumed we did not discipline him, people who assumed he was well when his hair grew back and people who had not one clue as to what we dealt with at home and hospital. Two sides of a story: the reality side and the viewable side. I’ve had students with autism, with hearing loss or vision loss, students with real life struggles that I watched be judged. On those rare occasions where I could explain, I would watch faces and attitudes change because the listener heard the rest of story. I’m sure each of you readers has a similar story you could share about being misunderstood, or feeling that you had another side to your story. What do YOU wish people had done differently? That’s what it takes—if each of us assumes there is more to the story, maybe each of our stories could be more beautiful! I haunted the hallways, waiting for the doctors to finish their regular morning meeting in the corner room. For days Pedro’s life had hung in the balance while a yeast infection in his blood ravaged his cancer-weakened body. The chemo treatment he had received shortly before the yeast started colonizing had killed off his white blood cells, and his body had nothing left to fight the newest onslaught. The day before, the doctors had discussed giving Pedro a white blood cell transplant, and had asked about possible sibling donors. I had called Pedro’s only sibling and he stood by, ready to fly to San Francisco and do whatever it took to help out. I let everyone back home and all of the people on the update email list know about the special prayer request—that Pedro’s brother be a match and that the white blood cell transfusion would turn the tide. “The white blood cell transfusion!” I exclaimed. I knew everyone discussed each patient every morning, so surely this doctor knew what Pedro needed. “No one told you?” he asked. “What?” my heart wavered between my toes and its usual place. The doctor’s stoic expression didn’t reveal much. I stood there, stunned, as he hurried off down the hallway, muttering something about miracles under his breath. A miracle of epic proportions, indeed. Pedro’s body had started producing white blood cells again two days earlier than it had at any other point during treatment. The prayer warriors had prayed for a successful transplant, and instead God had provided something even better—he had given Pedro the ability to fight on his own without another procedure. Looking back, I don’t understand the reason for the miracle (maybe I suffer from a bit of survivor’s guilt by proxy). Thousands of others have prayed for healing and for miracles, and God has answered their prayers differently. My own grandpa suffered a slow death from mesothelioma (lung cancer caused by exposure to asbestos). Maybe that doctor needed to see a miracle in order to believe in God. Perhaps a nurse needed to know that the selfless way she poured herself out each day on the cancer ward really did make a difference. Maybe I needed to realize that my arranging and organizing and control had little effect on the outcome of Pedro’s journey—God would perform miracles in his own time and of his own choosing. I needed to relinquish the driver’s seat and concentrate on prayer. Almost thirteen years have passed since that incident, and Pedro is living out his God-sized dream as the principal of a mission school for Native students. The work never ends, it seems. I don’t mind, though, because I know that God saved him for such a time as this. Today is World Cancer Day, and I’d like to thank God, first of all, for healing Pedro. I would also like to thank God’s hands and feet—the doctors and nurses at the University of California, San Francisco Parnassus campus who work tirelessly in the Hematology Oncology clinic and in the trenches on Eleven Long. Thank you. Your dedication to healing and helping thirteen years ago makes a difference in the lives of troubled kids today.